This was made ages back and I finally have the time to blog about it. I've tried 2 different recipes of charsiew. The one you see above is using Baking Mum's Charsiew recipe. This is a non-bake version of charsiew. 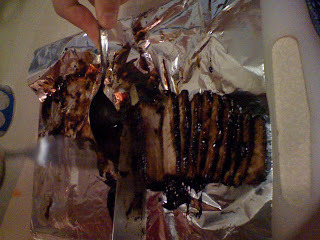 I think I used the wrong part of meat from the pig as you can see from the picture, pork belly can't be this thin. No fatty layers at all! This recipe, which I made some time later is using The Waitakere Redneck's Kitchen recipe. This is a baked version but I managed to turned it into a non-baked version too. I add 200ml of water into the wok and stir it around to mix well with the marinaded sauce. Then I cook it the same was as I did with Baking Mum's charsiew recipe. Verdict period, apart from the nice arrangement and the correct part of pork used (always use pork bellly! ), I really must say that Sinner's one is a better recipe. The addition of 'nam yue' and the tinge of 5-spice powder really did help to boost the charsiew flavour. I used one tablespoon water + 1 tbsp runny honey and brush it on the charsiew but it just seeemd to be useless.... only on occasions when I cook the charsiew in the wok until really dry, almost like 'chao tah' a lil' that the glaze will adhere to the pork. Nonetheless, it was fun and a good experience to make charsiew at home. 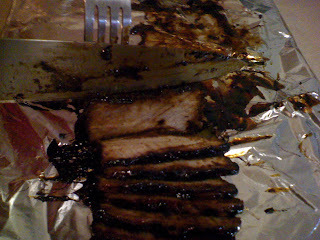 Too much is never enough because it is always gone even when I marinaded 2kg slabs of pork belly!